Starting out with a software project, authentication is usually quite a simple problem to solve. You simply create a users table in the database, collect users’ usernames and passwords (hashed and salted), and authenticate users against it. Just about every framework has a built-in way of doing authentication that can get you up and running within minutes. Usually this involves signing in the user once and storing the user’s ID in an encrypted cookie. Once the ID is stored in the cookie, all subsequent calls are authenticated using this stored user ID. This is a great way to get started but things start to break down a bit once your system contains more than one individual application, possibly under different subdomains, and you want the user to have a consistent authentication experience across the different parts of the system. Since I often use Rails I will use examples that are geared towards Rails in this post. The same principles will apply in different programming languages and frameworks as well though. Rails has a library called Devise that is just about the de-facto standard for authentication in Rails apps. Devise allows you to get set up quickly with a users table, password hashing, authentication strategies etc. Basically it allows you to call authenticate_user! (if User is the model class you are using to store user credentials) as a before_action on any controller that you only want authenticated users to have access to. Once authenticated, you can call current_user in the controller methods to access the currently logged-in user. This is a really nice and simple pattern and we would like to keep this pattern once we split our system up into several individual Rails apps. Let’s first look at the identity provider. In order to authenticate using a JSON web token, we need to add an authentication strategy to the Devise config. In order to encode and decode JSON web tokens, we need the jwt gem. Be sure to provide a secure secret key with which to encode and decode the JSON web tokens. The class also adds a csrf_token claim to the JSON web token that will be used in Rails apps 1 and 2 to protect against cross-site request forgery. The expiry is set at 1 week. # stored in a cookie. The user should be authenticated on each request. This puts the JSON web token authentication strategy first in the line of strategies for the user scope. Since Devise handles the authentication for us, we can just return the current_user in the JSON. 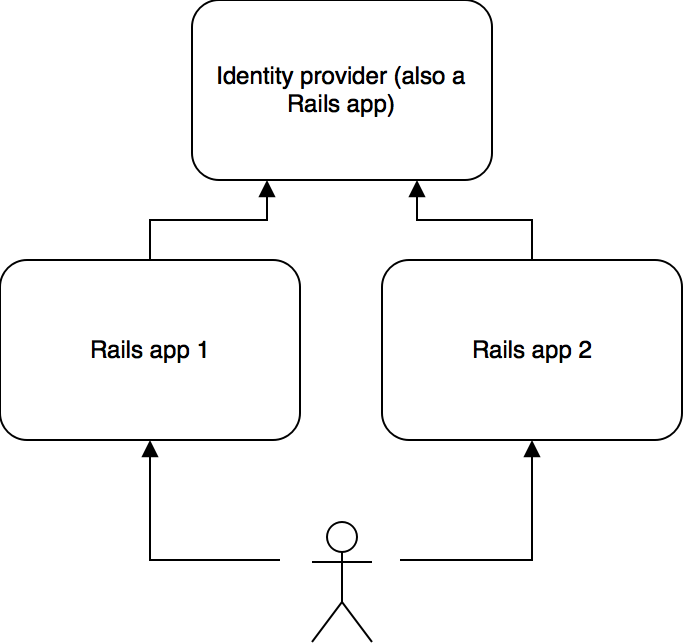 We now have all the tools we need to start using the identity provider from the other Rails apps. Now all controllers that derive from the ApplicationController will be authenticated against the identity provider service. Notice that the authenticity token is read from the JSON web token in order to protect against cross-site request forgery attacks. This is obviously dependent on the browser setting the X-CSRF-TOKEN header on AJAX POST, PUT and DELETE requests as well as setting the form_authenticity_token param in form POSTs. In conclusion, JSON web tokens provide an effective strategy to tackle the issue of moving the users table to a separate Rails app that acts as an identity provider in your system.